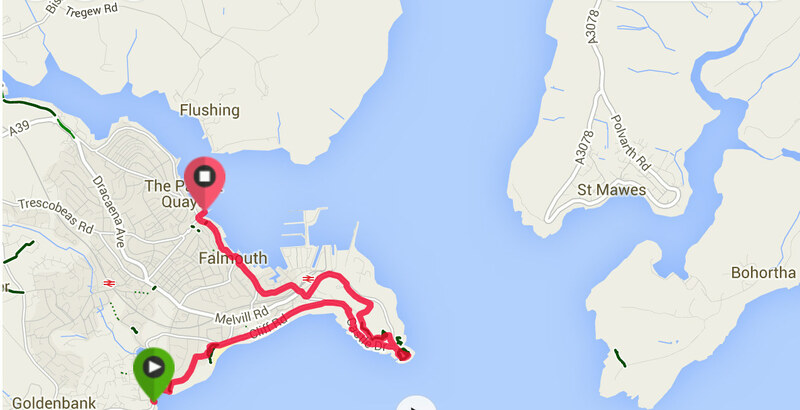 Falmouth is the home of MEI, and was recently voted the best place to live in south-west England. 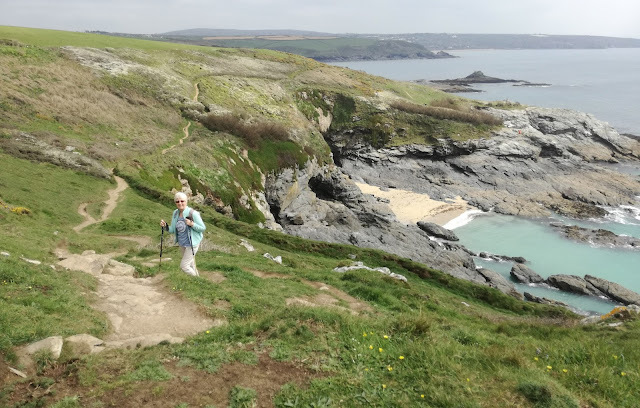 Personally there is no other place in the world that I would rather be, and this stretch of the Cornish coast path I have walked countless times, often with MEI Conference delegates, but never tire of it. It is not a typical coast path walk, in that it is all on paved pathways, but nevertheless is one of the easiest and most rewarding of Cornish walks. Falmouth lies between two beautiful rivers, the Helford to the south and the Fal to the north and after walking over the cliffs from the Helford River, crossing Falmouth's most southerly beach at Maenporth (posting of 10th April 2015) we arrive at Swanpool Beach and the start of the 4.3 mile leisurely stroll to the River Fal and the border between west and east Cornwall. 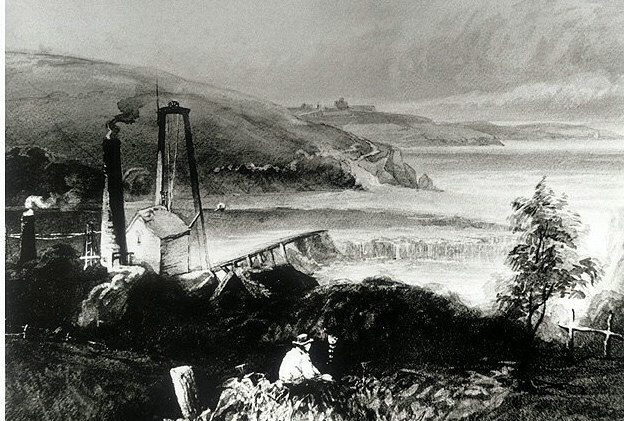 Although there is little evidence of it now, there was a lead-silver mine at Swanpool in the mid-19th century, and arsenic was also recovered by calcining, the remains of the arsenic works being visible on the cliffs to the west until being grassed over early this century. Pennance Point to the west, where the fumes were discharged, is still known locally as Stack Point. 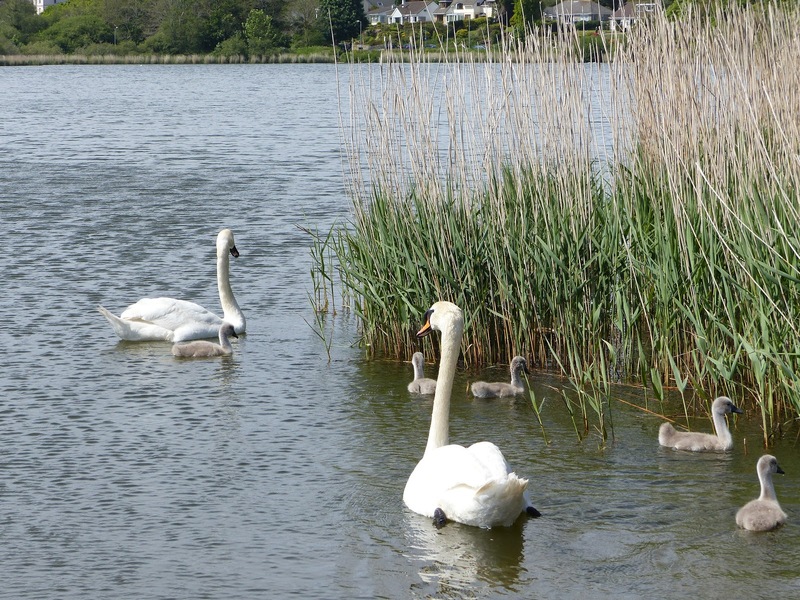 Before leaving Swanpool Beach, cross the road and take a look at the lovely small lake, from which the beach takes its name. Swanpool, a reserve to an abundance of birds, is fed by the little Bickland stream, and overflows into the sea via a culvert under the road. 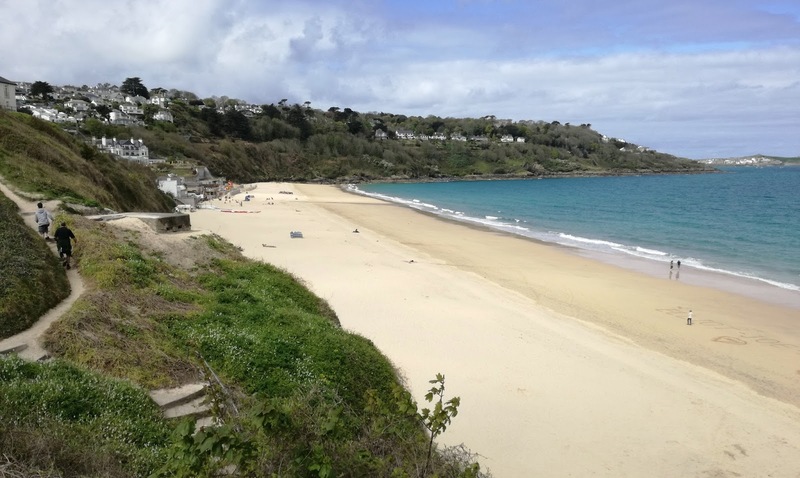 When leaving the beach take the upper path and walk across Boscawen field with its great view of Falmouth's main beach, Gyllyngvase, and the distance docks and castle. 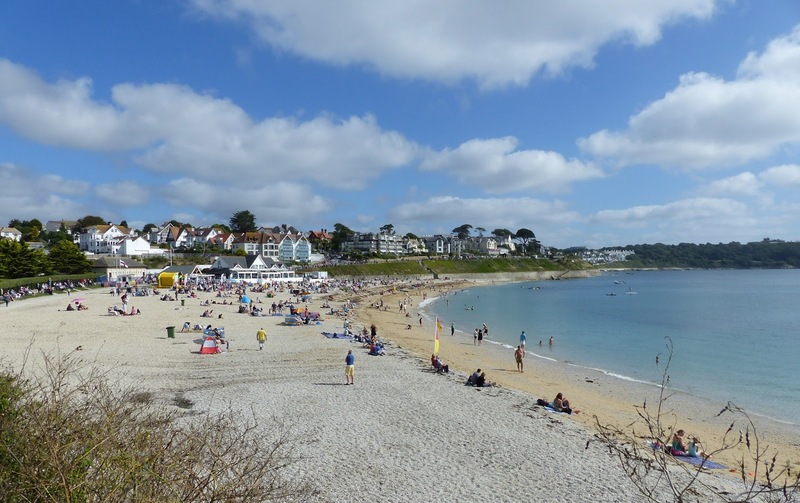 Gyllyngvase Beach marks the start of Falmouth's beautiful mile long Victorian promenade, which passes the lovely Gyllyngdune Gardens and the Princess Pavillion, where on balmy summer evenings it is worth stopping for a beer and listening to the brass band playing in the Edwardian bandstand. Castle Beach at the end of the promenade is a favourite for locals, as children love to explore the many rock pools at low tide. And if you are interested in geology, take a look at the rocks on the beach. They are over 400 millions years old, some of the oldest rocks in England. They were originally laid down as sandstone and silt sediments in the Devonian era, and remained undisturbed as horizontal strata for over 100 million years, until they were uplifted and deformed by the tremendous pressures of tectonic plates coming together in the final phase of the formation of the supercontinent Pangea. This uplifting produced the Variscan mountain range, the eroded remnants of which are America's Appalachians, the Urals, the Pyrenees, and, in SW England, the high moors of Dartmoor and Bodmin. This unimaginable tectonic pressure also partly melted the underlying mantle, which eventually solidified into a giant granite batholith, which underlies most of Cornwall, outcropping in several areas. The hot granite baked the deformed sediments into a hard metamorphic rock known locally as killas, which cracked as it cooled, allowing mineral laden waters to rise from the mantle, and crystallise in the cracks. In many parts of Cornwall tin and copper minerals crystallised, while in Falmouth you will see white quartz crystallised into these cracks. 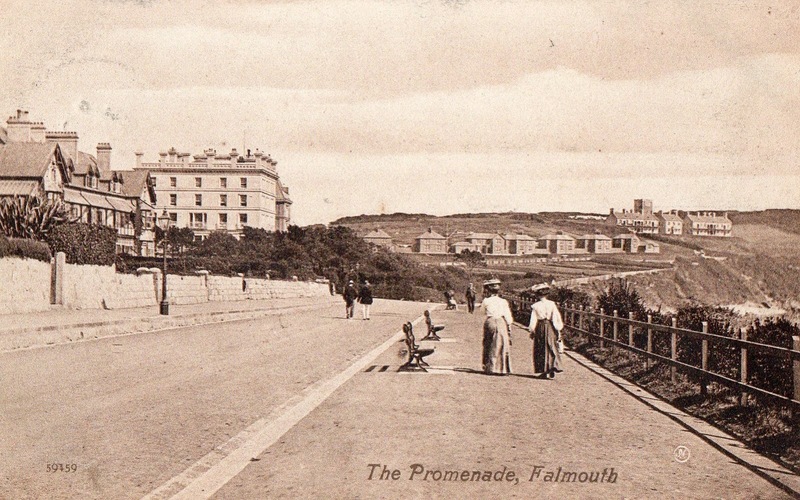 The promenade takes us to the scenic Castle Drive, leading to the Pendennis Headland and the estuary of the River Fal. The 16th century Pendennis Castle (posting of 4th April 2012) dominates the headland, and on the tip of the headland itself is the Little Dennis blockhouse, built as a look out post during the construction of the main castle. 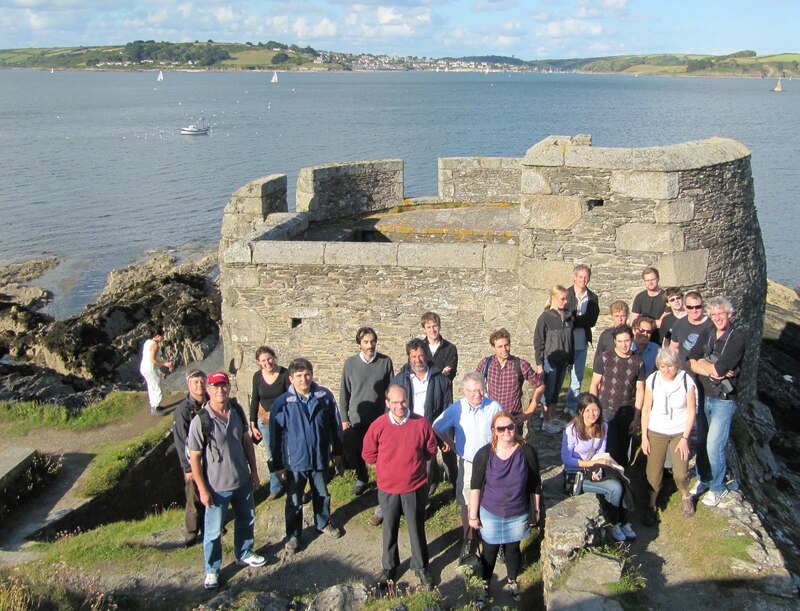 The blockhouse overlooks the estuary and the wide expanse of water known as Carrick Roads, which separates Falmouth from the Roseland peninsula, and the village of St. Mawes, which also boasts its own 16th century castle (posting of 20th September 2014). Both castles were built to guard the estuary and the access to the old town of Penryn. The Carrick Roads waterway was created at the end of the last Ice Age when sea levels rose dramatically and created a huge natural harbour. 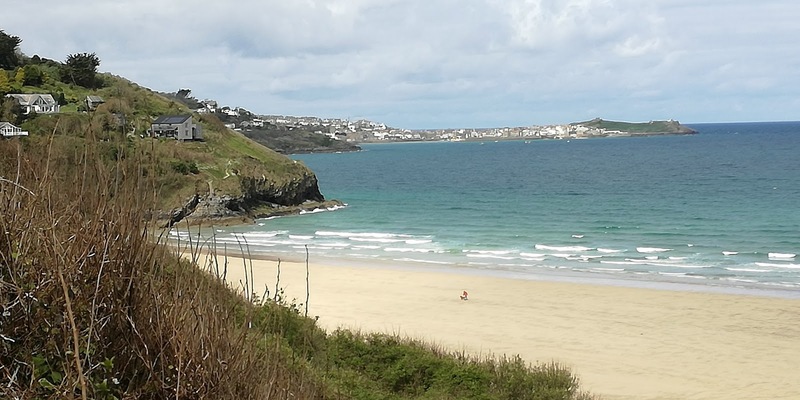 The Carrick Roads take the form of a classic ria, or drowned river valley, and is dominated by a deep, meandering channel, navigable all the way from Falmouth to Truro. The channel, the ancient River Fal, is navigable by very large vessels, and is up to 35 metres deep, but the banks rise steeply to depths of only around 10 metres. From the headland the best route is up via the Coast Guard Station to the castle's dry moat, passing some of the large guns which were positioned on the headland during WW2. 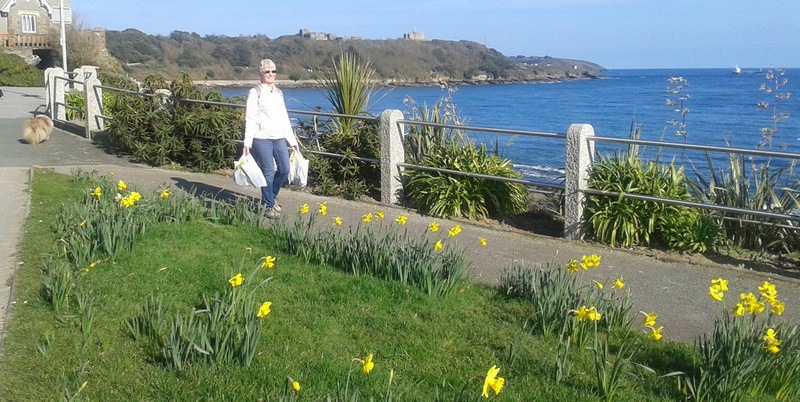 From the moat we arrive back on Castle Drive and the great view of Falmouth's huge ship repair docks, perfectly situated in the world’s third largest natural deep water harbour. 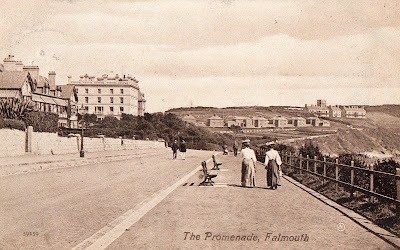 From the docks it is a short walk into Falmouth town, passing the docks railway station, the terminus for the Maritime Line from Truro, which was opened in 1863. 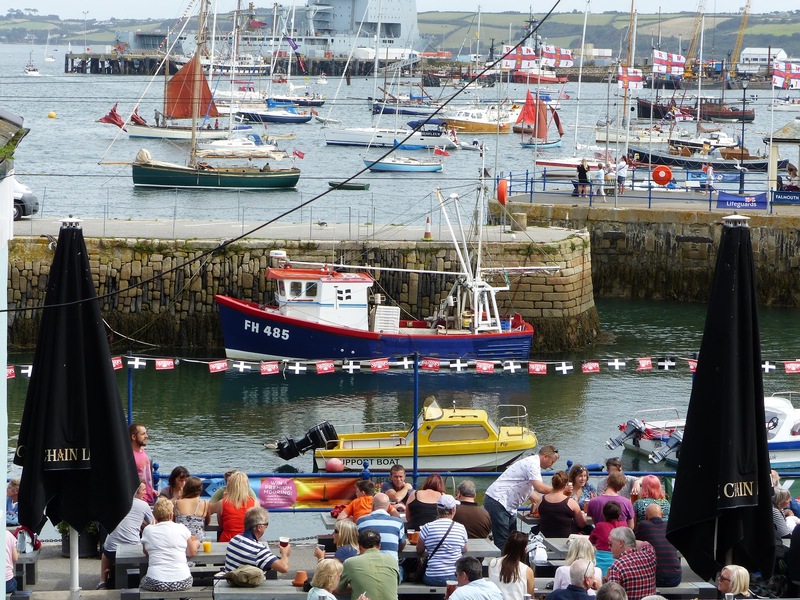 The area from Events Square, home of the Maritime Museum, and on to Arwenack Street, has some of the world's finest eclectic restaurants, as well as some great pubs, including the Chain Locker on Customs House Quay, the venue for most of the Cornish Mining Sundowners and a final watering hole for MEI Conference delegates after their guided coastal walk. Falmouth's bustling town centre stretching almost a mile from Arwenack Street, to Market Street and the High Street, has a whole range of shops and art galleries, and many coffee and pasty shops. 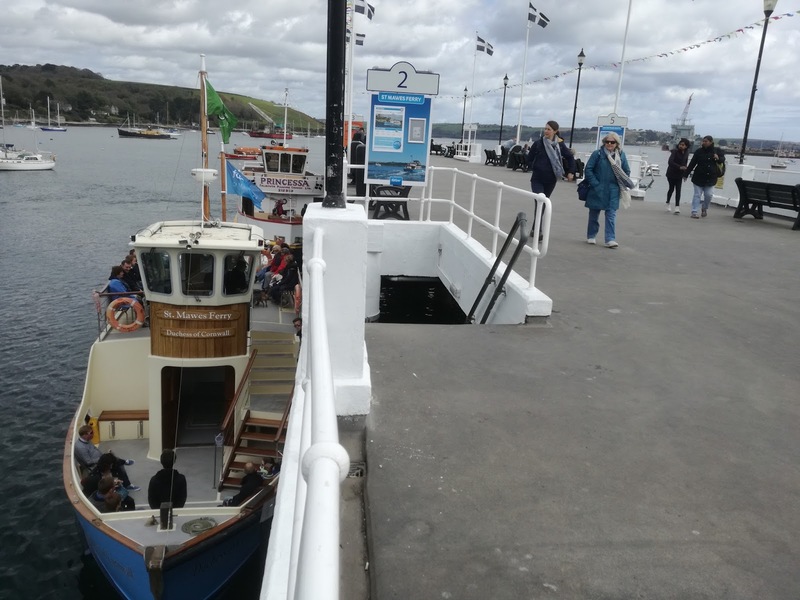 Just before the High Street is the Prince of Wales Pier, the border between West and East Cornwall, with its great views across the Penryn River to the tiny village of Flushing. From here ferries leave for St. Mawes and the Roseland Peninsula. I would like to congratulate Dr. Grace Ofori-Sampong, who is one of the Five Women Recipients of the 2017 Organization for Women in Science for the Developing World (OWSD)-Elsevier Foundation Awards. These awards are for Early Career Women Scientists in the Developing World, for outstanding research in Engineering, Innovation and Technology and for serving as inspiring role models for future generations of women science leaders. Although I have never met Grace, she has been a respected and diligent reviewer for Minerals Engineering for the past seven years. Grace is the winner for Sub-Saharan Africa for her work on mycohydrometallurgy (fungi-mediated gold extraction), recovery of precious metals, acid mine drainage mapping, safe practices in artisanal and small-scale gold mining, and her strong involvement in making a positive impact in the issues of women in science and engineering. The award recipients took part in the 2017 American Association for the Advancement in Science (AAAS) meeting in Boston, Massachusetts, USA, where they received the awards on the 18th of February, 2017. Dr. Grace Ofori-Sarpong is an Associate Professor of Metallurgical (Minerals) Engineering at the University of Mines and Technology, Tarkwa, Ghana. 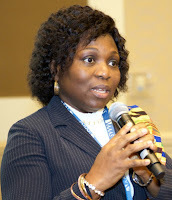 She is the first female to rise through the academic ranks to the position of Associate Professor in the field of Mining/Metallurgical/Materials Engineering in Ghana. Recounting her story on the journey that landed her to this height, Grace said, “the journey has not been without huge obstacles including traditional definitions of who a woman should be, societal demands on what a woman should do and family requirements of what a woman should have". Born into a large family with many people not having formal education or ending at pre-university level, it was difficult to convince anybody that a woman could live above the traditional limitations and reach out to unlimited heights. 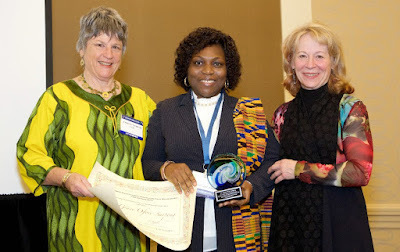 Grace got her Bachelor’s and Master’s Degrees from the Kwame Nkrumah University of Science and Technology, Kumasi, Ghana and her PhD from the Pennsylvania State University in the USA. Her research interests include mycohydrometallugy, environmental biotechnology, recovery of precious minerals, microwave processing of ores, water quality monitoring and small-scale gold mining/processing. She has over forty-five technical papers to her credit and several unpublished reports. She has held several positions in her university and is currently the Head of the Petroleum Engineering Department and the Vice Dean of the Planning and Quality Assurance Unit. She has also served as a visiting professor in other universities in Ghana and Africa. Grace is one of the few women who are making an impact in this predominantly male oriented minerals and mining engineering field in Ghana and also in the West-African sub-region. By dint of hard work and creativity, she has utilised fungi in the extraction of gold (mycohydrometallurgy) and, for the first time, the use of fungi in the degradation of non-organic sulphide minerals. She has been a role-model at several science and mathematics clinics for young females and has boosted girl-child education and interest in science and engineering. To get an appropriate platform for her passionate desires, Grace has recently founded an association known as Ladies in Mining and Allied Professions in Ghana, of which she is the president. Those of you who worked in the Cornish mining industry during the tin boom of the 1970s and early 80s may remember Derek (Del) Codd, an enthusiastic mineral processor, who died last week in Truro. 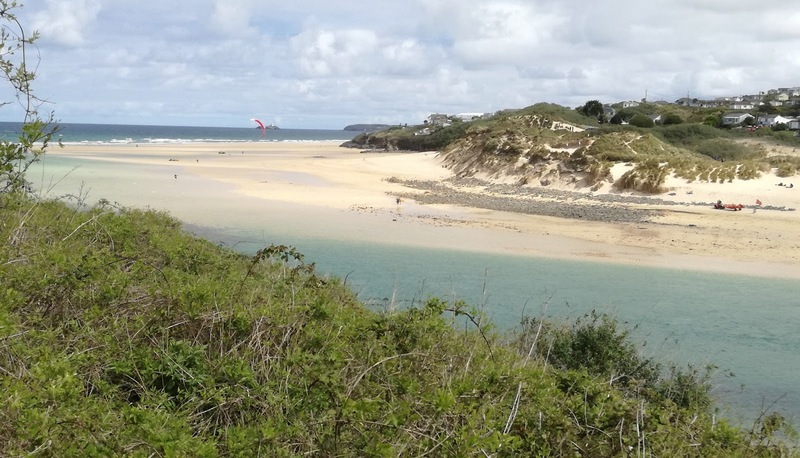 Dell worked for a time at the Tolgarrick tin streaming plant in Camborne, which reworked the tailings from South Crofty mine, which had been discharged into the Red River. He was also a part-time technician at Camborne School of Mines (CSM) and a member of the CSM cricket team in its debut 1980 season. 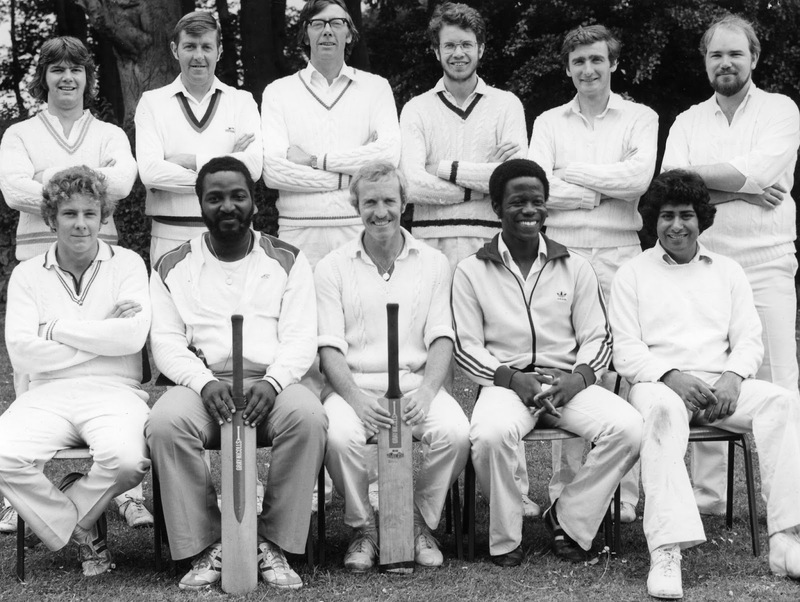 Cricket was one of his passions, and in later years he played for various Cornish village teams, and then became a cricket umpire and groundsman. Our thoughts are with Del's wife Pat and family. Water is necessary for life to exist at all. Every single life form on earth, from the single celled organism through the most complex organisms, relies on water for sustenance. Water makes up most of the world and the planet is seventy five percent water. Some 97.5% is saline water largely in the oceans, so that only 2.5% is fresh water and useful for human needs. Fresh water is a renewable and variable, but a finite natural resource. The demand for water is driven primarily by population and concomitant economic growth. Overall, some 70% of the water withdrawn from the environment is used in agriculture, 20% by industry,7% by households and 3% by mining. Future water requirements are predicted to grow considerably, while supplies will remain relatively constant or decline due to over pumping of aquifers, changing weather patterns and increased water pollution and contamination. While all regions will experience water scarcity to some degree, there are some countries where it will become more critical leading to conflict between consumers. Mining activities are often located in remote, arid environments, with limited access to high-quality water. Water rights in these regions are extremely contentious issues, in some instances leading to violent confrontation. This situation has the potential to only get worse because competition for ‘scarce’ water resources will increase with local population growth and agricultural land usage. Water used at mining operations comes from a variety of sources and the quantity and quality of the water varies from mine-site to mine-site. Mining impacts on water quantity and quality are among the most contentious aspects of mining and mining development. The main problem for the mining industry is to generate confidence in developing a responsible, sustainable and transparent water management strategy that is recognized as such by all stakeholders. This will be the subject of a keynote lecture at Sustainable Minerals '18 in Namibia next year, by Prof. Rob Dunne. Rob will provide an overview of water in the wider global arena and compare this to how the mining industry has dealt with water stewardship over the last couple of decades, and what the future may hold. 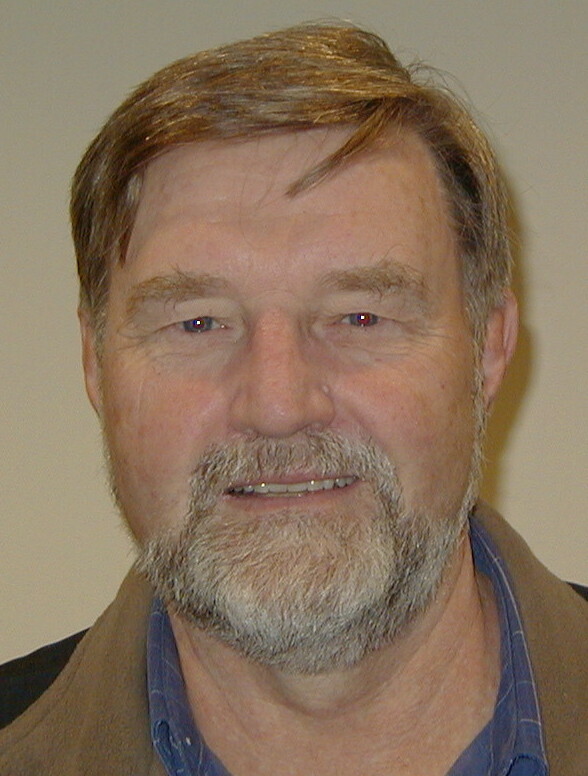 Robert Dunne was the Fellow Metallurgy at Newmont Mining Corporation before he retired at the end of 2013. Prior to this he held the position of Group Executive-Metallurgy Development and Technology. Over the last 35 years Rob has worked for a number of mining companies including Newcrest Mining, Anglo American, Anglovaal and Mintek. He has authored and co-authored over 80 papers and has been an invited conference plenary speaker. Water in the mining industry has been a focus over the last 10 years and Rob has given three plenary talks on this subject. He was nominated as a SME Henry Krumb lecturer and delivered a plenary talk on water to local USA branches of the SME. He is an Adjunct Professor at both Curtin University (Gold Technology Group) and Queensland University (JKMRC), Australia. One of my 10 recommendations for spending some time in Falmouth (posting of 11th March 2015) was a train ride from Falmouth to Penzance (via Truro) and maybe then on to St. Ives (via the branch line at St. Erth). If you enjoy a beautiful coastal walk, then another option is to take the train from St. Erth to St. Ives, but alight at the first stop, Lelant Saltings, which is on the estuary of the River Hayle. 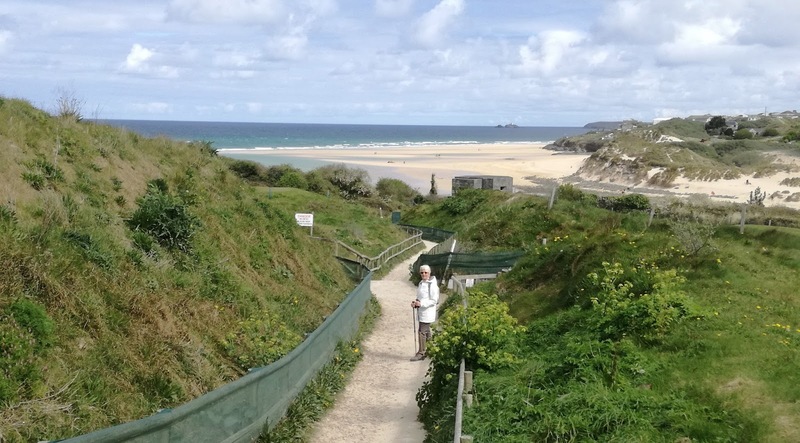 From here it is a relatively easy 4 mile walk to St. Ives, the coast path being accessed by crossing the West Cornwall golf course, and passing the 15th century St. Uny's church, where Richard Mozley is interred. 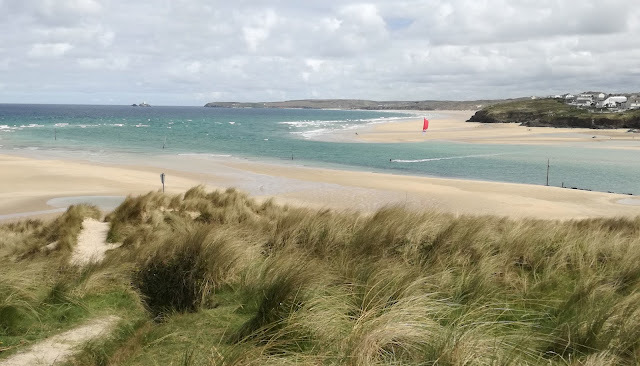 Once on the coast path there are great views across the estuary to Godrevy lighthouse and then the huge and lovely Porthkidney Sands. Once past Carbis Bay it is a gentle stroll to St. Ives, which can be extremely crowded in the summer months (a good reason for taking the train, as driving in the narrow streets can be a nightmare!). If you wish to linger, there are many fine restaurants, but you might wish to sample a Cornish pasty from one of the many "award winning" pasty shops, but be careful if you eat outdoors- the very large herring gulls here can be vicious and opportunistic- no wonder the original short story "The Birds" was set in Cornwall, not California as in the famous film. From St. Ives station take the short trip back to St. Erth, wait for the mainline train to Truro, and then change for Falmouth- a great day out! The merger of Minerals Engineering and International Journal of Mineral Processing (IJMP) will take place in January 2018 (see posting of 21 December 2016). 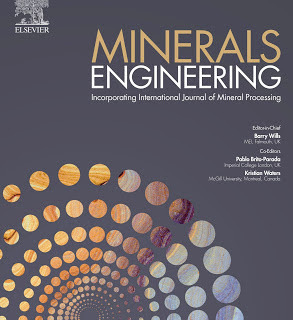 I will remain as Editor-in-Chief of the merged journal, and the co-editors will be Dr. Pablo Brito-Parada, of Imperial College, UK, the current Editor of Minerals Engineering, and Prof. Kristian Waters, of McGill University, Canada, who is currently an editor of IJMP. From 1 May 2017, submissions to IJMP will close and prospective authors should instead submit their papers to Minerals Engineering online. Four weeks ago Anita Parbhakar-Fox, husband Nathan, and their two sons, arrived in Cape Town to present papers at Process Mineralogy '17. They had been severely delayed on their long flights from Tasmania-Melbourne-Singapore-Johannesburg-Cape Town, as Nathan had to return to Tasmania to collect the children's birth certificates. This is a good opportunity to remind any of you who are travelling to a Cape Town conference, and bringing your family for a holiday in this beautiful area, that the immigration rules introduced by South Africa in June 2015 require parents travelling with children (under 18) to show the child’s full unabridged birth certificate, which should list the child’s details and both parents’ details. 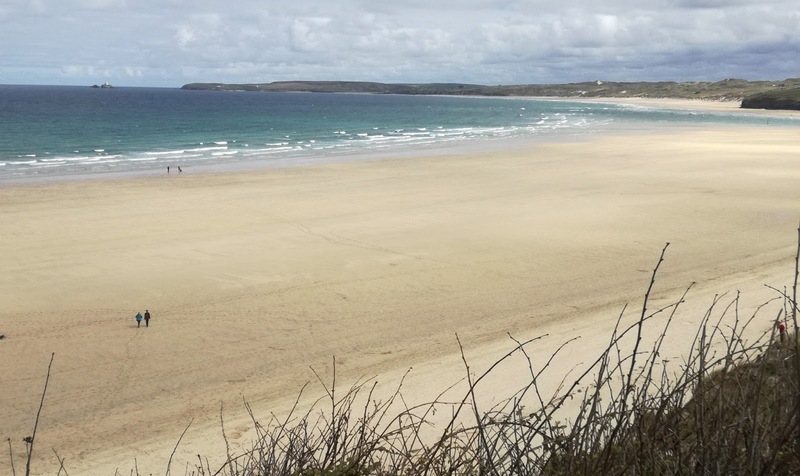 Anita is a great networker, one of the reasons that we chose her as one of MEI's Rising Stars, and all this week she and Nathan have been in Cornwall, as guests of Process Mineralogy '17 sponsor Petrolab, based in Redruth. The University of Tasmania and Petrolab are collaborators on a project funded by the Australian Academy of Technology and Engineering, aimed at refining test procedures to assist the mining industry with prediction and management of acid rock drainage. This was initiated via a meeting at Process Mineralogy '14. 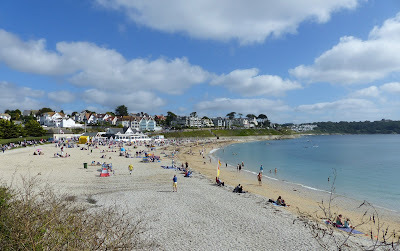 It was great to catch up with Anita and Nathan together with James Strongman and Chris Brough, of Petrolab, this lunchtime at the Gylly Beach Cafe, on Falmouth's Gyllyngvase Beach, opposite MEI's conference venue the St. Michael's Hotel. We have great corporate support for next year's Comminution '18, so this is building up to another great event. The latest sponsors are regulars, the giant international company Outotec, who are sponsoring the comminution series for the 3rd time, as are Chinese company Chemco Advance Material, a manufacturer of ceramic micro-beads. We also welcome back, for the 4th time, Korean company Cenotec, also a ceramic bead manufacturer. Cape Town next April should not be missed if you have any interest in comminution. If you would like to present a paper, please submit your short abstract by the end of September. Check out the report on Comminution '16. 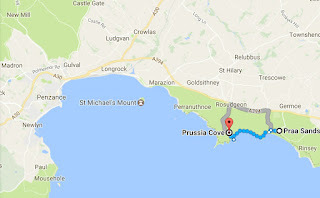 The long sandy beach of Praa Sands is only a 35 minute drive from Falmouth, and the fairly easy 2 mile walk from Praa Sands to Prussia Cove is one of Cornwall's best, taking in some superb clifftop scenery and a number of rocky coves, notably Bessie's Cove and Piskies Cove in the area known as Prussia Cove. 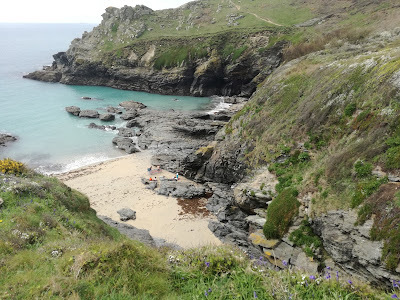 This was once one of the most intensively used areas for smuggling brandy as the small beaches are difficult to see from the top of the cliff. Bessie's Cove was used as one of the locations for the 1970s Poldark series. 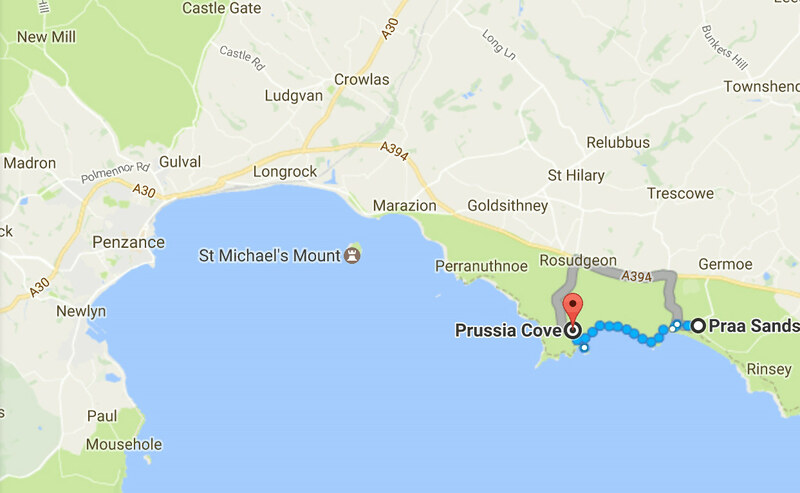 Those with a keen eye will also notice a subtle change in geology from the metamorposed sediments, including slates, near Praa Sands to the beginning of the Land's End granite which forms Cudden Point above Prussia Cove. Naturally I am proud and delighted to have been awarded the IOM3's Medal for Excellence, one of three of the Institute's Premier Awards this year to mineral processors (full details on MEI Online). Congratulations to Derek Barratt for the award of the Futers Gold Medal and Tony Francis for his Outstanding Contribution Award. When I was awarded the IMPC's Distinguished Service Award in Santiago in 2014 (posting of 23rd October 2014), I accepted the award on behalf of my wonderful family, aka the small and highly professional MEI team. And now I do so once again, as well as thanking all our many friends in the minerals industry who continue to drive our ambitions. It is with great pleasure that I have learnt that the Institute for Materials, Minerals and Mining (IOM3) in the UK has, in its 2017 awards list, announced that our colleague and friend Dr Barry Wills has been awarded the IOM3 Medal for Excellence. The International Mineral Processing Council and delegates to the XXVII IMPC in Santiago, Chile, in 2014 will all be very much aware of the enormous contribution which Barry has made to the discipline of Minerals Processing having been the recipient at that Congress of the IMPC Distinguished Service Award in recognition of his “outstanding and noteworthy contributions to the field of Minerals Processing over a sustained period”. Barry has for many years been a loyal supporter of International Mineral Processing Congresses and has played a prominent role globally for his pioneering work in promoting the discipline of mineral processing. He is still the Editor-in-Chief of the premier minerals processing journal, Minerals Engineering, which he founded in 1988. He is also well known for the high quality MEI Conferences which he has organized annually since 1990 at various venues around the world. These conferences cover, inter alia, the areas of comminution, flotation, process mineralogy, biohydrometallurgy, etc. Besides all this Barry’s seminal text ‘Minerals Processing Technology’ is now in its 8th Edition and remains arguably the most widely used book globally for students of mineral processing. The IOM3 citation states that “Barry has served the mineral processing community immensely by promoting the distribution and dissemination of mineral processing knowledge within the community of mineral processors and extractive metallurgists worldwide” and this echoes the citation for his IMPC Distinguished Service Award. On behalf of the International Mineral Processing Council and the global mineral processing community I wish to salute Barry for this further highly deserved recognition of his outstanding achievements and contributions to mineral processing. Long may these continue! Thankyou Cyril! The MEI team really does appreciate the recognition of our peers in this vital industry. Philip Gray, a true mineral processing visionary, died two days ago, on the day that the 2017 IOM3 Awards were announced. Philip was the recipient in 2013 of the Futers Gold Medal, one of the Institute's Premier Awards. He was President of the Institute, then the IMM, in 1984-5, during which period he was elected Fellow of the Royal Academy of Engineering (FREng). Active and perceptive right to the end, Philip was a great advocate of the Warner Process for direct smelting of sulphide ores, and was a keynote lecturer at MEI's Pyromet '07 in Falmouth. Two years ago I was honoured to interview him for MEI (posting of 2nd February 2015). None of Philip's close relatives survive him. 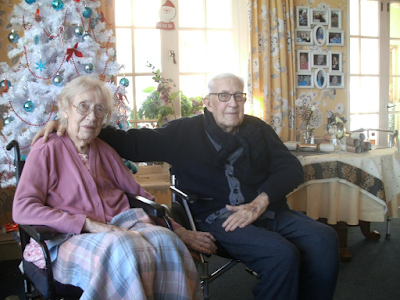 His wife Joan, to whom he had been married for 67 years, died only three months ago on New Year's Eve. I am sure that many of you will have memories of Philip and I invite you to add your own appreciations to this posting. The world's most important scientific conference takes place in Cape Town in November? Never underestimate the importance of the mining industry. I never do, but I know that many people do, including some within our industry. The world has an insatiable demand for metals and minerals, and the mining industry is the great feeder- without it no other industries could survive. It has become a cliché, but it is a fact that everything we touch is either mined or grown. The massive demand for minerals has meant that the mining industry has changed enormously from the activities of the late 19th and early 20th centuries. Ores then were fairly easy to treat. In the 19th century Cornwall was the world's largest producer of copper and tin. Copper ores were of very high grade and could be concentrated for the smelter by simple hand sorting, tin ores being treated by crude gravity concentration. The increasing demand after the industrial revolution, however, meant that the 'easy' ores were becoming worked out, and the ores available were becoming more and more difficult to treat. There was an urgent need to develop a new process for concentrating these ores, as simple gravity processes were not up to the job. The great saviour of the mining industry was froth flotation. Engineers at Broken Hill in Australia had been working on this since 1901 to enable extraction of huge quantities of zinc in the tailings dumps. It was also independently investigated by Guillaume Delprat of BHP, and Charles Potter, a brewer from Melbourne, who each patented processes to recover zinc from gravity tailings by adding acid to hot carbonate mineral slurries to generate carbon dioxide to float the minerals. Delprat's process worked succesfully at Broken Hill for many years, and there were various other attempts to use hydrophobicity, involving film flotation, which had been developed in the late 19th century, but the invention of modern flotation is attributed to Francis Elmore, who patented a vacuum flotation process in 1904, which was used in the Zinc Corporation plant for 6 years. The first recognisably "modern" flotation technique had been patented in London in 1903 by Sulman and Picard, and this used air bubbles formed by forcing compressed air through holes in the cell, but it would be years before such pneumatic cells would be commercially used. By 1908 flotation was working well for bulk flotation of zinc tailings, but the search was then on for means of treating primary sulphides, which led to the development of xanthate collectors, selective activators and depressants, and, as they say (another cliché), "the rest is history". Just as it is impossible to overestimate the importance of the mining industry so it is impossible to overestimate the value of froth flotation to modern society. How would we economically produce the metals and minerals that modern society cries out for without this process, which I have always referred to as the most important technological development since the discovery of smelting? As the available ores become leaner and more complex, so flotation must continue to adapt to effectively deal with them, so research both into the physical and chemical aspects of flotation (see also posting of 6th March) continues unabated. There will be many very large scientific conferences taking place around the world this year, some with thousands of delegates, but few will be more important to society than the relatively small one which takes place in Cape Town in November- it is Flotation '17. Flotation '17 will be the 8th in MEI's flotation series, and as always will attract the leading players in this field, researchers, equipment manufacturers, reagent companies and operators. Keynote lectures will be given by distinguished scientists, Prof. Roe-Hoan Yoon from Virginia Tech, USA (posting of 16 June 2016) and Dr. Bill Johnson from Mineralis Consultants, Australia (posting of 15th August 2016). There is now a final call for abstracts. If you would like to present a paper at the conference, please submit a short abstract no later than the end of May. 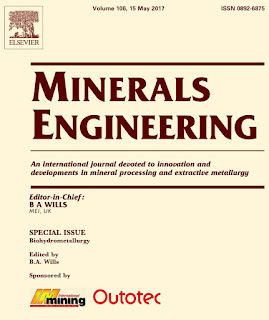 Papers presented at the conference will be considered for publication, after peer-review, in a special flotation issue of Minerals Engineering. If you have any interest in flotation, you must be at the beautiful Vineyard Hotel in November! Take a look at the report on Flotation '15. World Rankings of Minerals & Mining Universities- a very strange list indeed! 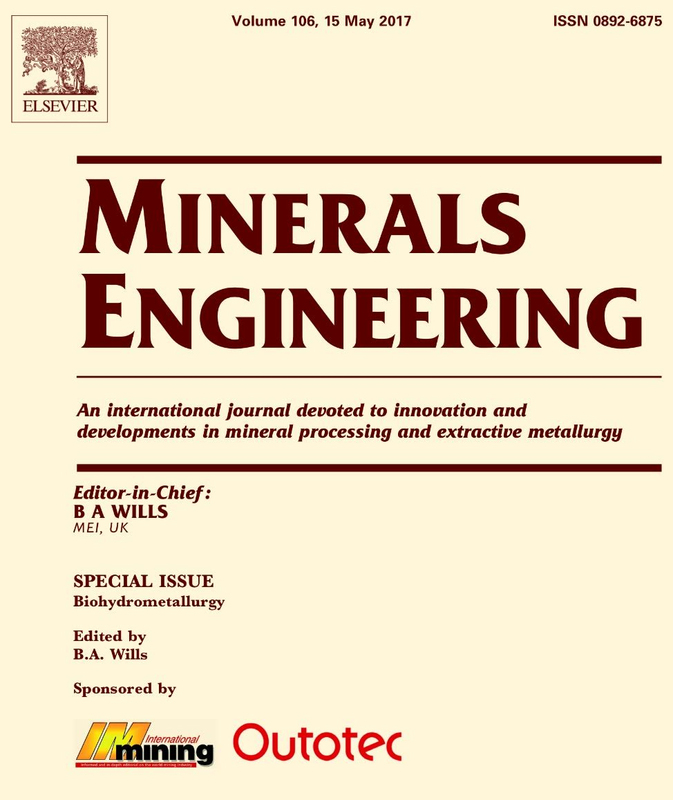 Volume 106 (May 2017) of Minerals Engineering is now available on ScienceDirect, and contains 17 selected papers from Biohydromet '16, which was held in Falmouth, Cornwall last June, including a very interesting keynote paper from Frank Roberto of Newmont Mining, USA, on the commercial heap biooxidation of gold ores. The conference proceedings, containing all the unrefereed papers, is available on USB from MEI Online. Biohydromet '18, MEI's 9th conference in the series, will be held in Windhoek, Namibia in June next year, back to back with Sustainable Minerals '18. There is no mining operation in the world which does not make use somewhere in the flowsheet of the density difference between solids and liquids, and gravity concentration, as well as sorting, are the oldest methods of concentration. Add to this magnetic separation and we have the ingredients for the fine technical programme for Physical Separation '17 in Falmouth, Cornwall in June. Our six major sponsors represent all the physical separation techniques, the latest being Chinese company SLon Magnetic Separator Ltd.
SLon is a leading supplier, producer, manufacturer of high gradient magnetic separators (HGMS) and wet high intensity magnetic separators (WHIMS). It designs, develops, manufactures and markets magnetic separation equipment for beneficiating weakly magnetic minerals, and for purifying non-metallic minerals. The company became a leading provider of WHIMS in China in 1980s, and from the 1990s it has become a leading world supplier of high gradient magnetic separators. SLon has partnered with giant international company Outotec to provide innovative tailored solutions for a wide variety of customer needs in the iron and steel, aluminum and non-ferrous metals industries, and Outotec is responsible for customers in Africa, North America, South America, Europe, Russia and countries of the former Soviet Union and Australia, having five pilot-scale units available for testing around the world, as well as lab testing capabilities in the USA. Outotec USA will be represented at the conference by Riddhika Jain, who will present a paper on automation for efficient separation of the Outotec SLon VPHGMS. This machine is used for processing fine, weakly magnetic minerals, such as hematite, limonite, ilmenite, manganese, wolframite, tantalum-niobium, and etc. It is also suitable for removing iron and titanium from non-metallic minerals such as quartz, feldspar, nephline, fluorite, ceramic material, and etc. So there is much to look forward to in Falmouth. 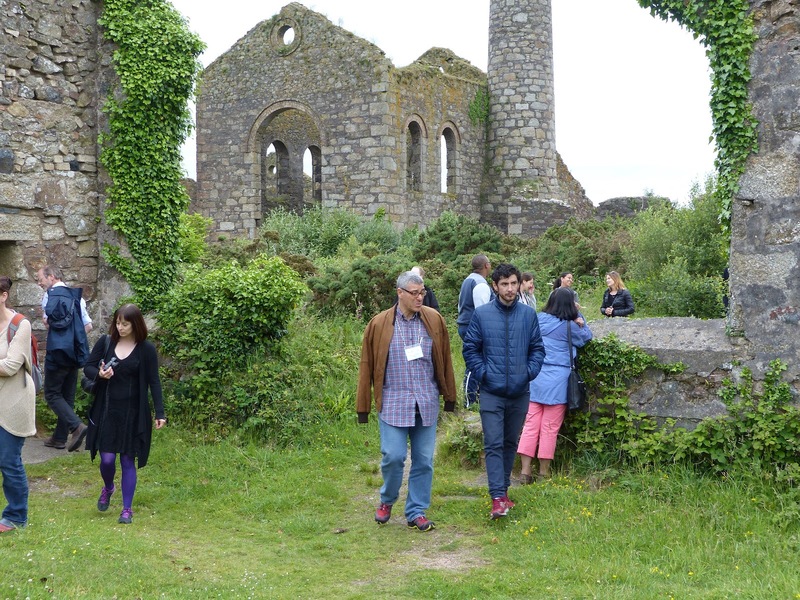 Apart from the technical papers, there will be the presentation of the 2016 MEI Young Person's Award, an evening walk along the beautiful Cornish coast to awaiting drinks in a local hostelry, and a visit to the remains of the 19th century tin and copper mines in the Camborne-Redruth area. And an added bonus- come a couple of days earlier and register for Computational Modelling '17- there are discounted rates if you attend both conferences. Great news this morning of another potential Cornish mining revival. 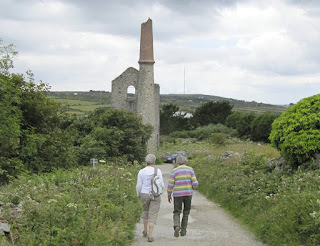 It is over 150 years since klestrolite, a mineral unique to Cornwall, was mined at Wheal Clott near Redruth. Klestrolite is the only edible mineral to have been mined in Cornwall. It is a milky-white coloured mineral, which when ground very fine and mixed with water produces a delicate creamy paste, known as 'clotted' cream' named after Wheal Clott, the only known source of the mineral. When the mine was worked out clotted cream continued to be produced in Cornwall, but made from dairy products. Now a rich vein of klestlorite has been found associated with quartz in hydrothermal veins in the local granite. The exact location has not been revealed but it is known to be a rich source which should boost employment in the county as well as giving locals and tourists alike the real taste of a traditional Cornish cream tea. 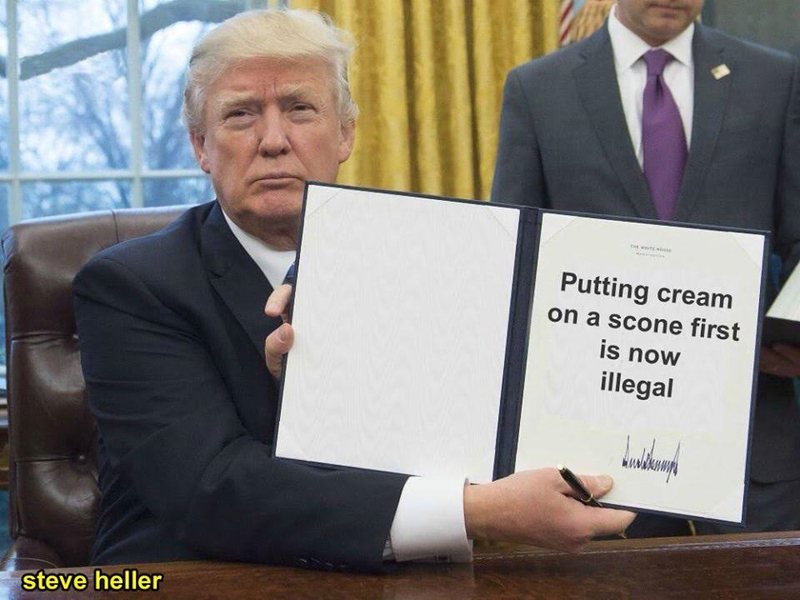 It is known that klestrolite is an anti-bacterial agent, which may be why the Cornish traditionally add cream on top of jam in their scones, and, recognising this effective barrier to foreign bodies, this has led to one of President Trump's more important executive orders.